Kaliber Gaming's NUKLEUS Universal Gaming Headset is designed to deliver the core features needed to destroy the competition, without destroying your budget. The NUKLEUS features large 50mm drivers inside noise-isolating ear cups for deeply immersive sound, with the clarity for faint details like your opponent's footsteps. NUKLEUS also includes a built-in volume control, flexible boom mic, and a universal 3.5mm audio connector. 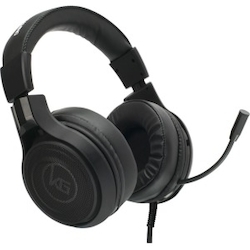 Features: Universal stereo headset for use with Xbox One S/Xbox One, PS4, PC/Mac, and mobile devices; Large 50mm drivers deliver immersive highs and powerful bass; Flexible boom microphone for gaming chat.